OBSERVACIONES: RESTAURACIÓN DE INSTRUMENTOS DE PERCUSION. CONGAS Y TUMBADORAS 11" Y 12", CAJONES PERUANOS, TAMBORAS, GÜIRAS, BAR CHIMES, CLAVES CUBANAS, REPARACIONES. FABRICACIÓN DE INSTRUMENTOS ESPECIALES A MEDIDA. OBSERVACIONES: Constructor y restaurador de instrumentos de cuerda en general. Constructor de guitarras clásicas, flamencas, australianas y de diseño contemporáneo. Maestro de Luthería. Miembro de la AAL. OBSERVACIONES: LUTHIER CON MAS DE 25 AÑOS EN LA PROFESION, SE DEDICA A LA FABRICACION DE GUITARRAS CLASICAS, GUITARRONES CUYANOS Y CHARANGOS. OBSERVACIONES: INSTRUMENTOS MUSICALES DEL MUNDO, CONTRUCCION Y REPARACION. CONCIERTOS Y CD´S. OBSERVACIONES: CLASES DE LUTHERIA. CONSTRUCCION, RESTAURACION Y REPARACION DE INSTRUMENTOS DE ARCO. OBSERVACIONES: RESTAURACIÓN DE INSTRUMENTOS DE PERCUSION. CONGAS Y TUMBADORAS 11" Y 12", CAJONES PERUANOS, BAR CHIMES, Y FABRICAMOS CUALQUIER INSTRUMENTO A MEDIDA. OBSERVACIONES: CONSTRUCCION DE BAJOS ACUSTICOS Y ELECTRICOS. REPARACION Y CALIBRACIONES. OBSERVACIONES: CALIBRACION EN GENERAL Y REPARACION DE INSTRUMENTOS ACUSTICOS Y ELECTRICOS. OBSERVACIONES: CONSTRUCCION DE INSTRUMENTOS DE ARCO, ENCRINATURAS CONSTRUCCION Y RESTAURACION DE GUITARRAS. OBSERVACIONES: CONSTRUCCIÓN DE CHARANGOS, VIOLINES, CAJAS DE PERCUSIÓN, CAJÓN PERUANO, BONGÓ Y OTROS DE VIENTO. REPARACIONES Y ENVÍOS A TODO EL PAIS. OBSERVACIONES: CONSTRUCCION Y RESTAURACION DE INSTRUMENTOS DE CUERDAS. CALIBRACION DE INSTRUMENTOS ELECTRICOS. OBSERVACIONES: PROYECTO, DISEÑO Y REALIZACION DE GUITARRAS CLASICAS CONTEMPORANEAS. CALIBRACIONES, REPARACIONES Y RESTAURACIONES DE INSTRUMENTOS DE CUERDA. OBSERVACIONES: CONSTRUCCION DE VIOLINES, VIOLAS Y CELLOS. OBSERVACIONES: CONSTRUCCION Y REPARACION DE INSTRUMENTOS DE CUERDA Y PERCUSION. AFINACION DE PIANOS. INSTRUMENTOS ESCOLARES. OBSERVACIONES: ARREGLOS DE INTRUMENTOS DE CUERDA EN GRAL., CALIBRACIONES, REPARACIONES, ETC. OBSERVACIONES: REPARACION, AFINACION, COMPRA Y VENTA. OBSERVACIONES: RESTAURACIÓN DE ARMONIOS, VENTA DE INSTRUMENTOS Y PIEZAS, HISTORIA, ASESORAMIENTO Y CUALQUIER TEMA RELACIONADO CON EL INSTRUMENTO. OBSERVACIONES: REPARACIONES CONFIABLES Y PROFESIONALES. OBSERVACIONES: CONSTRUCCION, CALIBRADOS Y REPARACION DE INST. DE CUERDA Y RESTAURACION DE INST.ANTIGUOS. OBSERVACIONES: CONSTRUCCIÓN DE FLAUTAS IRLANDESAS DE MADERA, CON Y SIN LLAVES. OBSERVACIONES: CONSTRUCCION DE VIOLINES DE CONCIERTO Y VIOLINES CON DISEÑO Y COLORES EXCLUSIVOS. OBSERVACIONES: CONSTRUCCION DE INSTRUMENTOS DE ARCO - REPARACIONES. OBSERVACIONES: REPARACION,RESTAURACION,CALIBRADOS Y FABRICACION ARTESANAL DE CONTRABAJOS ,CELLOS Y VIOLINES. OBSERVACIONES: LUSTRE Y REPARACION DE GUITARRAS, CON TECNICAS ANTIGUAS Y MODERNAS. OBSERVACIONES: CONSTRUCCION DE BAJOS Y GUITARRAS ACUSTICAS, CLASICAS, FLAMENCA ETC. OBSERVACIONES: TODO LO QUE NECESITES PARA TU GUITARRA O BAJO, ELECTRICO O ACUSTICO. OBSERVACIONES: CONSTRUCCION, REPARACION CALIBRACION DE INSTRUMENTOS DE ARCO Y OTROS. VENTA DE ACCESORIOS. OBSERVACIONES: LUTHIER DE SAXOFONES -CLARINETES Y FLAUTAS. OBSERVACIONES: DAMA LUTHERIA ESTA LANZANDO UNA LINEA DE CAJONES PERUANOS FABRICADOS EN MADERA MACIZA DE CEDRO. EL CAJON TIENE TERMINACION HECHA EN MARQUETERIA FINA , LA FRECUENCIA RESONANTE DE SU CAJA ESTA CALCULADA PARA ARMONIZAR CON LA 6° CUARDA DE LA GUITARRA. TIENE GARANTIA Y RESPALDO DE IMPORTANTES PERCUSIONISTAS ARGENTINOS. PARA MAS INFORMACION Y PARA COMPRA DIRECTA DE FABRICA COMUNICARSE CON DAMA AL TELEFONO 4611-4016. OBSERVACIONES: CONSTRUCCIÓN, REPARACIÓN Y CALIBRACIÓN DE INSTRUMENTOS DE CUERDA EN GENERAL. TEL.03541-15576705. OBSERVACIONES: TALLER DE LAUDERIA SOLEDAD CONSTRUCCION DE INSTRUMENTOS DE CUERDA PULSADA GUITARRAS, BARROCAS, VIHUELAS, LAUDES TRADICIONALES MEXICANOS JARANAS, BAJOSEXTOS ETC. OBSERVACIONES: QUENAS PROFESIONALES, INSTRUMENTOS FOLKLORICOS DE VIENTO, MOSEÑOS, TRAVERSAS DE BAMBÚ, SHAKUHACHI, SAXOS DE BAMBU, CLARINETES DE BAMBU. MARIMBAS Y XILOFONOS DE BAMBU. OBSERVACIONES: TALLER DE LUTHERIA VENTA Y REPARACION DE INSTRUMENTOS DE CUERDA Y PERCUSION. CURSOS DE CONSTRUCCION. 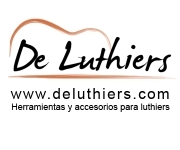 OBSERVACIONES: LUTHIER: CONSTRUCCIÓN, REPARACIÓN, RESTAURACIÓN, TODOTIPO DE INSTRUMENTOS. OBSERVACIONES: AFINACIÒN DE BANDONEONES Y ACORDEONES. REPARACION INTEGRAL A NUEVO. TRABAJOS GARANTIDOS. PRECIOS MODICOS. OBSERVACIONES: GUITARRAS ARGENTINAS DE CONCIERTO DE ALTA CALIDAD. FABRICADAS INTEGRAMENTE EN MADERAS MACIZAS Y CON CORTES DE PRIMERA SELECCION Y BUEN ASENTAMIENTO. OBSERVACIONES: AFINACIÓN DE BANDONEONES Y ACORDEONES. REPARACIÓN INTEGRAL A NUEVO. TRABAJOS GARANTIDOS. PRECIOS MÓDICOS. OBSERVACIONES: CONSTRUCCION Y REPARACION DE INSTRUMENTOS DE CUERDA ACUSTICOS Y ELECTRICOS. OBSERVACIONES: LUTHIER CHILENO DE GRAN EXPERIENCIA CON INSTRUMENTOS DE MUY BUENA CALIDAD SONORA. OBSERVACIONES: REPARACION.LUSTRE.AFINACION DE BANDONEONES.Y REPARACION Y LUSTRE DE GUITARRAS. OBSERVACIONES: LUTHIER-REPARACION, RESTAURACION DE INSTRUMENTOS DE VIENTO. SAXO. CLARINETE. FLAUTA. ZAPATILLADOS. CALIBRACIONES. DESABOLLADOS. BAÑOS DE PLATA, ORO. RELAQUEADOS. REGRABADOS. FABRICACION DE PIEZAS ROTAS Y/O FALTANTES. MODIFICACIONES ERGONOMICAS. REPARACION Y VENTA DE BOQUILLAS. COMPRA Y VENTA DE INSTRUMENTOS. OBSERVACIONES: FABRICACIÓN, REPARACIÓN Y REGULACIÓN DE ARPAS CLÁSICAS. FABRICACIÓN INTEGRA DE ARPAS DIATÓNICAS (CELTAS Y PARAGUAYAS). OBSERVACIONES: CLINICA EXCLUSIVA PARA INSTRUMENTOS DE CUERDA. GUITARRAS Y BAJOS ELECTRICOS Y ACUSTICOS, MANDOLINAS ETC. RECTIFICACION, CALIBRADO, ADAPTACIONES, REPARACION, RESTAURACION. OBSERVACIONES: FABRICAMOS CAJONES PERUANOS, CAJONES FLAMENCOS, BATAJONES, DJEMBE, CAJA BONGO, CAJA UDU, TUMBADORAS, CHIMES Y OTROS INSTRUMENTOS MÁS A BASE DE MADERA. OBSERVACIONES: VIAJAMOS LLÁMENOS Y CONSULTE. OBSERVACIONES: CALIBRACION Y REPARECION DE GUITARRA Y BAJOS ELECTRICOS Y/O ACUASTICOS. CAMBIO DE MICROFONOS, CLAVIJAS, PUENTES, MODIFICACION DE CIRCUITOS ACTIVOS Y PASIVOS, CONFECCION DE CEJUELAS EN HUESO, MADERA, PLASTICO Y BRONCE. PRESUPUESTO SIN CARGO. OBSERVACIONES: BATERIAS FIERROS Y PLATOS MARCA"JJL"
OBSERVACIONES: CONSTRUCCIÓN DE GUITARRAS, CLÁSICAS, FLAMENCAS Y CONTEMPORÁNEAS. REPARACIÓN Y PUESTA A PUNTO INSTRUMENTOS DE CUERDA EN GENERAL. OBSERVACIONES: REPARACIÓN A NUEVO, LAQUEADOS, PLATEADOS AJUSTES DA MAQUINAS, VARAS, CAÑERÍAS BRONCES CAÑAS, AERÓFONOS (ENZAPATILLADOS) REPUESTOS A PEDIDO, SOLDADURAS DE TODO TIPO. OBSERVACIONES: LUTHIER-REPARACION, RESTAURACION DE INSTRUMENTOS DE VIENTO. SAXO. CLARINETE. TROMPETA. FLAUTA. ZAPATILLADOS. CALIBRACIONES. DESABOLLADOS. BAÑOS DE PLATA, ORO. RELAQUEADOS. REGRABADOS. FABRICACION DE PIEZAS ROTAS Y/O FALTANTES. MODIFICACIONES ERGONOMICAS. REPARACION Y VENTA DE BOQUILLAS. COMPRA Y VENTA DE INSTRUMENTOS. OBSERVACIONES: BIENVENIDOS A MM BASSES. BAJOS Y GUITARRAS HECHOS A MANO, UNO A UNO EN COLOMBIA. HACEMOS NUESTROS INSTRUMENTOS CON PASIÓN Y MUCHA DEDICACIÓN UTILIZANDO LAS MEJORES MADERAS NATIVAS Y EXÓTICAS COLOMBIANAS, COMBINANDO LOS MEJORES HERRAJES Y ACCESORIOS DEL MERCADO. CADA VEZ QUE COMENZAMOS UN PROYECTO, ESCUCHAMOS CUIDADOSAMENTE A NUESTROS CLIENTES Y LOS ASESORAMOS EN LA SELECCIÓN DE MADERAS Y COMPONENTES, MANTENIENDO ESTÁNDARES DE CALIDAD MUY ALTOS A PRECIOS ASEQUIBLES. UN INSTRUMENTO POR ENCARGO ES LA OPORTUNIDAD DE CONSEGUIR EXACTAMENTE LO QUE USTED NECESITA. OBSERVACIONES: UN SITIO PARA HACER CONOCER LOS LUTHIERS ARGENTINOS. NOS SOBRA CALIDAD Y TALENTO. PORQUE COMPRAR INSTRUMENTOS IMPORTADOS? Professional Oboe repair & sales F. Lorée & MCW Instruments - Used Instruments - Expert repair Services Finest Quality Cane and Supplies - Specialty Items - Hand-made Reeds - 3124 S. Abingdon St. - Arlington, VA 22206 - U.S.A.